Neil Young reminds me of the serial killer next door. You can just hear the neighbor saying, "We never saw him much. He was quiet but he always nodded when he was in the yard." Whether or not Young can carry a tune, his distinctive voice is unmistakable. 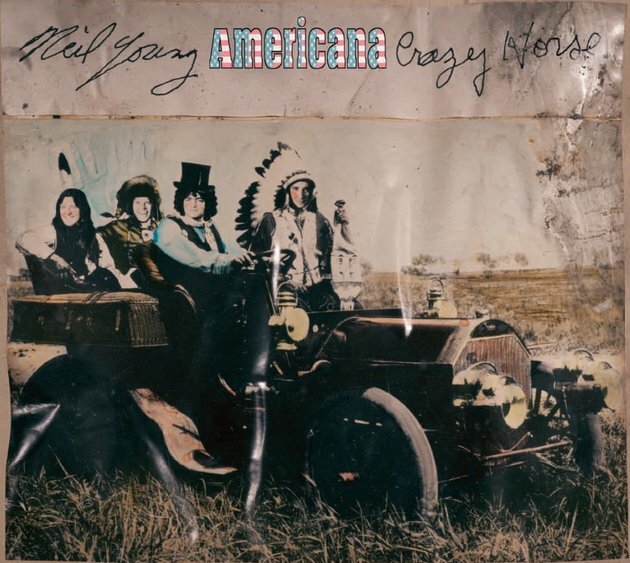 Today his first album with his iconic sixties band, Crazy Horse, was released. Americana is just that... sort of. Young takes a set of songs that are American standards like Oh Susannah, Wayfaring Stranger and Darling Clementine and makes them his own. No really, Oh Susannah and Clementine (two of my favorite songs) have totally new melodies, as if Young is somehow channeling Kurt Cobain. Think about it. 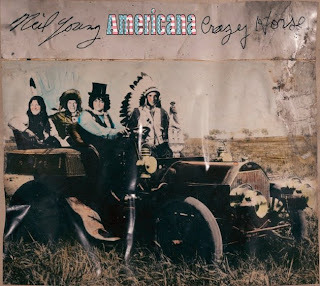 Kurt Cobain and Stephen Foster drop acid in Purgatory and possess Neil Young and they make an album. I will hand it to Young, he has taken a bunch of songs that are often thought of as songs to sing with the kids and brought back their original gruesomeness. Rarely does this verse find its way into the children's sing-along. "I come from Alabama with my B-A-N-J-O on my knee." Given that much of this week has been taken up with Queen's Jubilee, Young does what may be the most original version of God Save the Queen since Sid Vicious. During the Jubilee coverage, I did have this moment during the endless playing of GSTQ when I thought to myself, "Why are they playing My Country Tis of Thee? Young gives us the perfect amalgamation of both songs aided by a children's choir. I really wanted to love this, and in a way I do. It forces the listener to hear that which we are familiar with and view it in a totally different way. It is good to shake things up now and then. That being said, I wanted a nice, acoustic rendition of Neil Young singing Oh Susannah in the same traditional way he does This Land Is your Land but noooo! If he were here, I would take my B-A-N-J-O and hit him upside the head.